Key to our ethos is to ensure that we are an economic benefit to the communities we visit. By using locally owned hotels and transport, eating in a variety of local restaurants and employing local guides in the Imperial Cities, we spread the economic benefit to as wide a circle as possible and that money stays in country. It is also a great way to get closer to the local culture. Certain departures (ref DMR) stay in restored and renovated 17th century riads - the traditional merchants houses. These riads are usually found at the heart of the old cities and their popularity means that there is increased interest in preserving the rich architectural heritage of Morocco. On this tour, we visit the Association for the Disabled in Southern Morocco. This association is only one of two in the whole of Morocco. We support this good cause by purchasing goods crafted by those who learn valuable skills by the Association. As well as the above, we support a variety of charities and projects worldwide which support vulnerable communities and habitats including Friends of Conservation, Hope Worldwide and Send A Cow. We are also actively engaged with UK travel industry bodies which promote best practice in responsible tourism, such as Tourism Concern, The Travel Foundation and AITO. Our commitment to responsible tourism is not limited to our overseas operation and we have measures to ensure our UK office operates according to our responsible tourism policy. Carbon offsets for all flights booked with us are included in the tour cost. Driving up into the High Atlas and stepping out into the snow. Lots more events too that were memorable. A torch is very useful - head variety is what I would recommend. One member of our group ignored the instructions about a sleeping bag, bought blankets with the guide's help and claims to have been as 'warm as toast' for the couple of nights we were in the dormatory. I am not advocating ignoring advice, or taking up a guides time and personally I was pretty cold the first night of the dorm stay. Most of the world does not want your toilet paper down the loo, regardless of what sort of loo it is! Not so sure about this. I felt obliged to get my foot hennaed to get some money over the ladies, (it seemed a bit expensive at 50 Din. I did buy from the Marjana Women's Cooperative Argan oil too. There was not much attention paid to plastic waste re. water etc. There's a lot in this question so it might be better to separate off the issues in future. Not sure how our trip contributed to conservation, although we did visit some out of the way places which presumably would no longer be cared for if it would not for tourists. Excellent - I will certainly investigate this operator's tours in the future. The desert experience, and traveling through the mountains were the real highlight of the trip. Our tour leader was particularly excellent, and gave us a really good insight into many different aspects of the country. Credit cards were not accepted in most places we travelled - you will need to ensure you have a lot of cash. ATMs were readily available, but don't plan on using plastic. This was unexpected, as we have not had this experience traveling in countries less developed than Morocco. Hot water was available in most of the hotels, but occasionally not. Would suggest ensuring you have shampoo (not available in most hotels) and washing powder, as laundry facilities were not available everywhere (and quite expensive and not of a good standard in one hotel in particular). Launderettes in the larger cities were good. As you're on the go constantly, this is not a vacation for someone looking for relaxation. Yes; hotels, restaurants & sightseeing were generally confined to smaller co-operatives or family run operations. A very positive experience; we have come back with a very good impression of Morocco and its people, and will be recommending it to friends and family. This was our first group trip ever, and we found the experience to be very positive; we are likely to book further trips through this operator in the future. The whole vacation was very memorable with a great variety of things to do and see. There was never a dull moment as the different aspects of Moroccan life unfolded before our eyes. It was quite cool for the first week especially north of the Atlas mountains. So take some warm clothing as well as summer wear. Be careful about taking photos ,especially of women it can be offensive. Yes , I think it is important to spread ones money around , although at times I felt we were traveling well travelled paths and being directed to certain eating places. **** Some stories to tell the grandchildren, I would not hesitate to recommend it to a friend......a fantastic vacation ...one that we will never forget. An excellent vacation which we would definitely recommend to others interested in Morocco. Our guide, Lahoacein, was outstanding, not only in his knowledge of and passion for his country, but for his willingness to share a part of himself with strangers. As a result, we were given an insight into a foreign country and culture that gave us a familiarity rarely achieved in a fortnight’s vacation. He openly discussed both the good and bad aspects of his country, its primary religion, politics, family life, social structure, et al. He is a lovely man with whom we hope to keep in contact. Also a short word for our bus which was pink (therefore easy to spot) but, more importantly, it had 34 seats in addition to the driver’s and his assistant’s. This meant we were all able to spread out with our various backpacks, cameras, etc. and enjoy seeing the countryside slide by during some quite long journeys. Well done! As with all sojourns into a foreign country, we encountered minor problems. We were surprised by the amount of money required for tips (1200 D for the two of us) and meals (roughly 400 D per day including wine). Based on past experience and the knowledge that we would be paying 3200 D on arrival, we brought about £900 with us in cash. Thanks to ATM machines, we were able to add to that considerably, so were not inconvenienced. I also want to say that the idea of giving the guide 1200 D for tips is an excellent one, avoiding the need for us to dig in our pockets several times every day. The following list will give you an idea of how we spent our time. 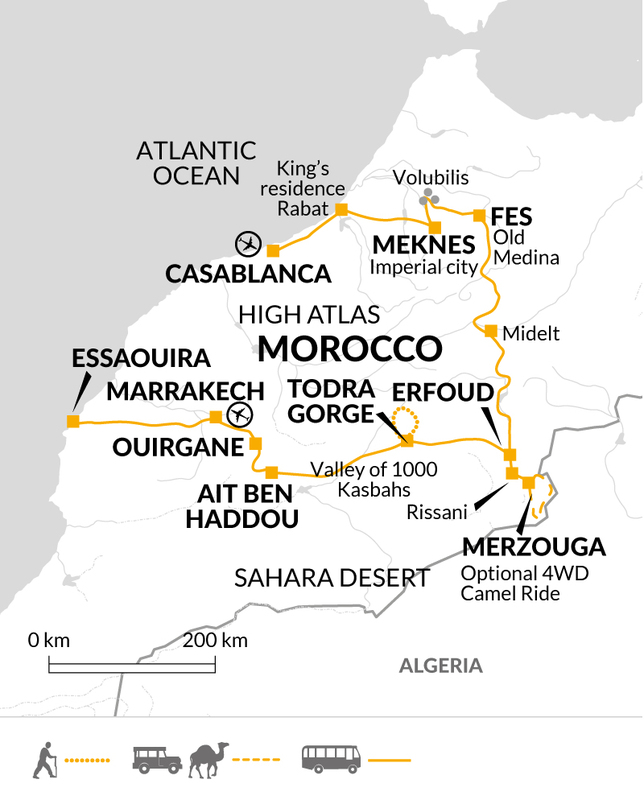 Casablanca, Rabat, Meknes, Moulay Idriss, Volubilis, Fez, Erfoud, Sahara, Todra Gorge, Ourzazate, Essaouira, Marrakech. No time to read the guide book or write postcards and we returned home absolutely knackered. It might be useful to cross out a kasbah or two to give travelers a short break every now and then. Special highlights! We very much appreciated this operator's attempts to introduce us to the “real” Morocco. By that I mean the Association for the disabled, the Co-op for divorced and widowed women, the adobe home in the Sahara, and the Bedouin tent in the Atlas Mountains. These experiences say a lot about Morocco’s problems, and are important for visitors to understand, perhaps more so than the splendid souks. But I suppose that there is little to compare with teaching the Berber musicians in the desert tent how to do the Hokey Cokey and sing Auld Lang Syne. I am sure we are “gone but not forgotten”! Thank you for your correspondence regarding the above tour. We were delighted to read that you enjoyed your trip and your Tour Leader, Lahoacein, contributed to the success of your vacation. It is always good to know our efforts are appreciated and therefore we are pleased to pass on your kind comments to all those involved with your tour arrangements. We were also pleased to read that you were happy with the pink bus and that you enjoyed the benefit of having a little more space. We were sorry to learn that you encountered minor problems with regard to the amount of money you required. It has come to our attention that there has been a confusion surrounding the amount of money required for the tipping. A cheque and cover letter regarding this matter will be sent to you shortly. We are sorry for any inconvenience that may have been caused. We were concerned to learn of your comments regarding the Riad in Fes and we would like to assure you that your feedback has been passed to our Operations team who are investigating alternative options. In addition to this we also appreciate your comments regarding the compact itinerary. Thank you for bringing this to our attention. We appreciate you taking the trouble to give us such detailed feedback about your vacation. Please be assured that we follow up on all customer comments, therefore your correspondence has been brought to the attention of the Operations Manager responsible for the smooth running of this trip. We are always looking to improve the content of our vacations for our passengers and your comments regarding these issues shall certainly be considered carefully. Thank you, once again, for taking the time to write as it is only with such constructive comments that we are able to monitor and hopefully improve all aspects of the tours we offer. We hope that the memories of teaching the Berber musicians how to perform the Hokey Cokey will stay with you and that we will have the pleasure of your company on another trip in the not too distant future.